The appeal of Canada's She-Devils is pretty clear. One would have to be a pretty hard-hearted listener to not appreciate the charms of the band's music as revealed on their self-titled debut album. Out on Friday via Secretly Canadian, the release is full of the sort of infectious alternative pop that was so prevalent in the Nineties. And that's not to say that this duo are some kind of retro act but, rather, that they perfectly understand how to make music like this in a way that far too few acts do anymore. "Hey Boy" saunters in with a vibe reminiscent of underappreciated Aussies Frente!, while the mid-tempo "Darling" coasts by on a kind of sound that recalls Blondie. Elsewhere, "How Do You Feel" and "Blooming" echo Catatonia and The Cranberries, respectively, with each cut a perfectly composed and performed little marvel. At their very best, like on the Smiths-like swagger of "You Don't Know", or on the languid, near-tropical "The World Laughs", Kyle Jukka and Audrey Ann Boucher offer up material that's as light as a feather but with just the right amount of seriousness. There's nothing silly here, even if the mood and touch are natural and unforced. And, it's worth saying, that She-Devils seem to understand exactly the limits of their sound. While the cuts on She-Devils are not particularly revolutionary, they are expertly performed. 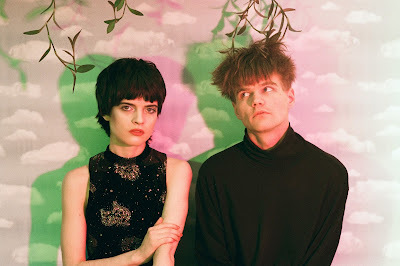 Rather than make any big radical moves, She-Devils are more content at quietly edging things towards something more challenging, as indicated by the slightly-squalling guitars of "Never Let Me Go" which briefly sees the duo hint at something darker. But, truly, She-Devils don't need to get serious, or dark, as the indie-pop here is fresh and charming in all the right ways. Tuneful and quietly upbeat, the 10 cuts on She-Devils are sure to worm their way into your ears like they did mine. She-Devils is out on Friday via Secretly Canadian. Follow She-Devils via the band's official website, or via their official Facebook page.